This item was purchased by allenp91. Shima Sakon Tomoyuki Battling Saito Daihachiro Toshitsugu - Dramatic scene of the warriors Shima Sakon Tomoyuki and Saito Daihachiro Toshitsugu dueling on the shore of a river. In the center, Toshitsugu thrusts his naginata at his opponent, gripping the handle with both hands. 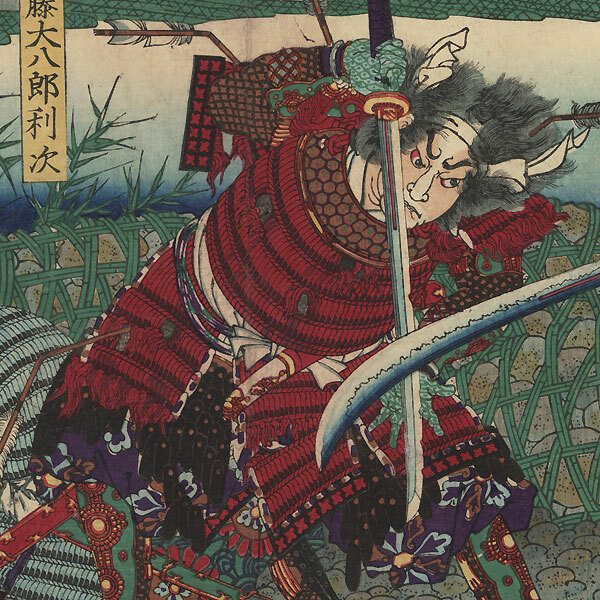 Tomoyuki counters the blow with his sword, holding the blade with both hands. His armor is tattered and torn, and pierced with broken arrows, and a severed head lies on the rocky ground between the pair. At right, a general on horseback waves his tasseled command baton as he and his retainers watch the duel. Several egrets fly overhead against the dark night sky, startled by the commotion. 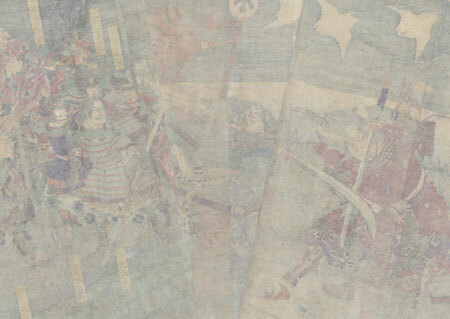 A terrific early warrior triptych by Yoshitoshi, detailed with fine line work in the armor and expressive faces and bokashi shading in the setting. Image Size - 13 7/8" x 28"
Condition - This print with excellent color and detail as shown. Three separate panels, backed with paper. Vertical centerfold in each panel. Loss and tear, a few holes and thinning spots, repaired. Slight toning and soiling, slight curling at sides. Please see photos for details.